Your daughter has been kidnapped, but you are no muscle bound Mayor like Haggar. Instead you are Rick Quinn, a man happier to use his arms, rather than his hands. 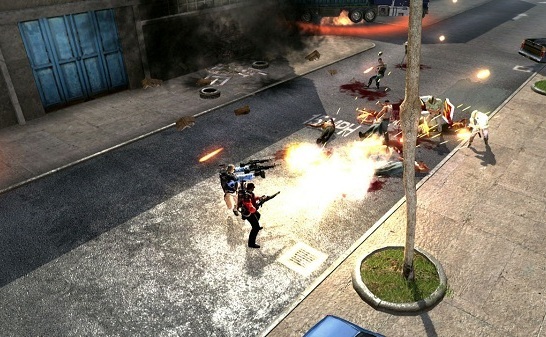 Can he cause total annihilation in Narco Terror, a 2 player co-op twin stick shooter from Deep Silver? Ever since I ran around the screen in Commando, I have had a soft spot for top down shooters. I loved the likes of Smash TV and Cannon Fodder, but have we not moved on from these days? If you play Deep Silver’s Narco Terror, you may not think so. Rick is a man on a mission. That mission is seemingly borrowed from the Liam Neeson Taken school of action – kill everyone in the way of your kidnapped daughter. The game starts off in an industrial zone; you are limited to a pistol. Use the left stick to move and the right stick to shoot bad guys – rinse and repeat. The core mechanics of Narco Terror are as old as I am (and that is old), but if they ain’t broken, why fix them? This is true, but it is nice to see the old design choices tweaked for a new generation and Deep Silver at least attempt this. The samey twin stick shooter levels are interspersed with some airplane based SHMUP levels – these are blessedly short as the standard is not great. Another improvement on the ways of old is the game hides its linearity by opening up the levels, you feel like you are constantly pushing forwards. There are multiple weapons to be unlocked later in the game from close range shotguns to long range machine guns. As you progress, you can spend money on upgrading your weapon of choice. This adds a RPG-lite feel to the game, but is not really enough to make the mode stand out. Another area that is an advancement on the past, but not quite enough, is the graphics. The game looks good for a downloadable game and there is a lot of stuff to blow up in the game. Some of the most entertaining moments I had were destroying vehicles in various car parks. However, the bland textures and repeat use of visual assets means it soon blends into one homogenous whole. 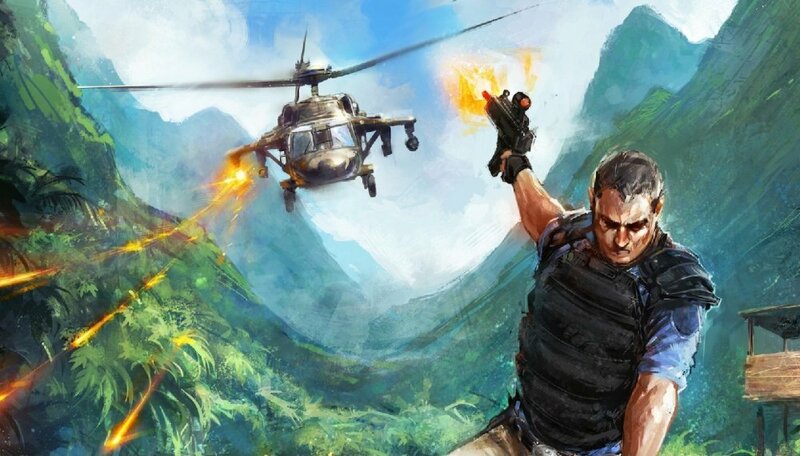 Narco Terror can be tackled solo, but for Co-Optimus readers and all lovers of teamwork, there is the ability to play online or offline 2 player co-op. Both modes appear the same – a single screen shooter. Essentially you get the single player campaign, but with the added bonus of a buddy who appears to look the same as you, but in a different color palate. This can be a little confusing in some of the more hectic fights, as you struggle to work out which of the Rick Quinn’s is you. The co-op has been implemented very solidly by the development team at Deep Silver. There is little lag when playing online and the drop in/drop out works well. I found that with the game’s community being quite small, the best way to find a game was to start a solo campaign and leave it open for people to join. When another player joins there is a nice message stating that the game plays better when you work together. A very Co-Optimus sentiment! As with all narcotics based fun, there are some crushing lows that come with the highs. There are glitches in the game. I managed to walk out of the map a couple of times and get stuck behind scenery. There is also the inherent issue with any single screen co-op game – which way do you go? One player may be trying to head right, the other left. You end up in a battle of the wills. Therefore, like in most co-operative games, playing with a friend, or at least communicating with your partner, is a real help. A plus point of co-op is that if one of you dies, you respawn in 10 seconds, as long as your partner remains living. This means that the game is far more forgiving in co-op. What can be said about Narco Terror? It is a solid, if slightly uninspiring game. It rocks in at a decent price level and for the cost you get a good chunk of game, even if it is the same gameplay over and over again. In single player you may find the challenge of endless enemies too much to bear, but with a co-op partner, either offline or online, you will find the game a little easier and a little more fun. There is nothing to stop fans of twin stick shooters picking up the game; it feels like an open version of Zombie Apocalypse. Just don’t expect to remember much about playing Narco Terror once you have stopped. The Co-Op Experience: Two players can team up and dish out steaming plates of leaded justice in drop-in/drop-out local or online co-op.